A leading international Muslim organization has paid tribute to late South African leader Nelson Mandela, sending Muslim scholars’ condolences to South Africa government and people, as well as supporters of freedom and dignity in Africa and worldwide. 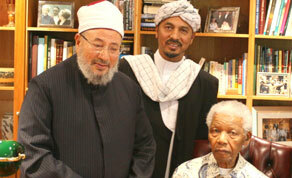 “The International Union for Muslim Scholars (IUMS), chairman, secretary general and members, send their condolences to South Africa government and people in the departure of Nelson Mandela, an icon for struggle towards freedom, justice and human dignity,” IUMS said in a statement obtained by OnIslam.net on Saturday, December 7. A leading Qatar-based cleric declared in a religious edict, or fatwa, on Saturday that Egyptians should support ousted President Mohamed Mursi of the Muslim Brotherhood and the military should withdraw from the political scene. 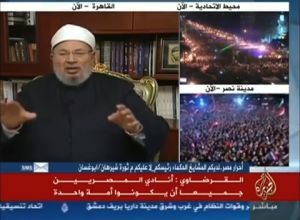 As the political crisis in Egypt escalates, dividing Egyptians into supporters to President Dr. Mohamed Morsi and protesters, Dr. Yusuf Al-Qaradwi addressed the Egyptian people in a televised speech broadcasted by Al-Jazeera Channel on Sunday, June 30, 2013. Dr. Al-Qaradawi called Egyptians to adopt dialogue to reach a solution for the current deadlock and to steer clear of all causes of disagreement. Andy Newman responds to the latest Islamophobic publication by One Law for All, Siding with the Oppressor: The Pro-Islamist Left. 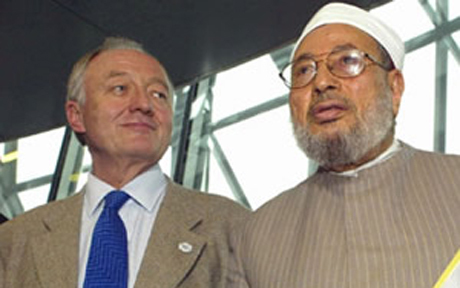 That’s the claim made in the Daily Telegraph by Alan Johnson, Senior Research Fellow at the pro-Israel advocacy organisation BICOM, who is upset about Yusuf al-Qaradawi’s highly-publicised visit to Gaza. 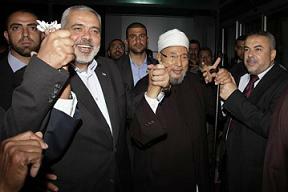 Prominent Muslim scholar Sheikh Yusuf Al-Qaradawi arrived in Gaza late Wednesday, May 8, in a major blow to a crippling Israeli blockade on the strip. “Our whole ambition is to die on the path to Allah, and for long life to Palestine,” Qaradawi said upon arrival in Gaza, Agence France-Presse (AFP) reported. 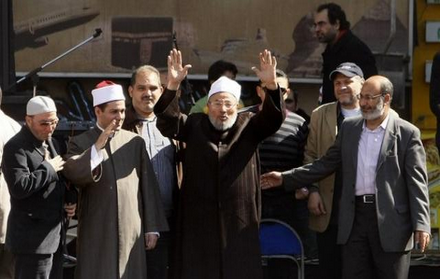 Leading a delegation of 50 scholars, Qaradawi crossed Egypt’s Rafah border terminal into Gaza. He was greeted by Hamas Prime Minister Ismail Haniyeh and senior leaders of the resistance movement. 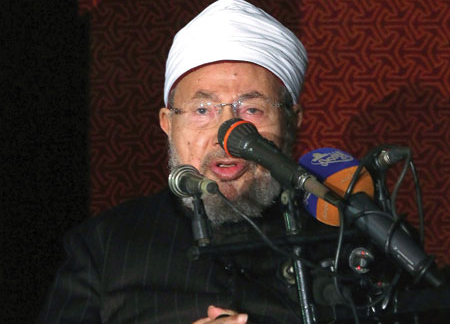 Winning 39.9 percent of votes, Dr. Yusuf Al-Qaradawi, is chosen for the second consecutive year as the Scholar of the Year by OnIslam visitors. The selection reflects the great impact of Dr. Al-Qaradawi in the fields of Islamic scholarship and da`wah and the high esteem he is held in. Despite his old age, Al-Qaradawi, 86, is remarkably known for his active involvement in the events touching the Muslim Ummah,whether in person or through the organizations he heads, such as the International Union for Muslim Scholars (IUMS). That goes in line with his deep belief in Islam as a comprehensive way of life and his conviction that the role of scholar is far greater than retreating to a mosque and teaching people about the devotional rituals of Islam. The atrocities committed by the Syrian dictator, Bashar Al-Asad, and the massacres of Muslims in Myanmar, along with the challenges facing the Egyptian revolution were among the major events in 2012 that had much of Dr. Al-Qaradawi’s concern and effort. Besides, in the scholarship arena, Dr. Al-Qaradawi continues to add to his list of books, that has exceeded 170. He is working now on a new, more elaborate edition of his famous book Al-Halal wal-Haram fil Islam (The Lawful and the Prohibited in Islam). Prominent Islamic cleric Dr Yousuf Al Qaradawi has urged Egyptian Christians to remain united and help build a new Egypt. Delivering the Friday sermon at Al Azhar University Mosque in Cairo yesterday, he called on all Egyptians, Muslims and non-Muslims, rival political factions, the ruling elite as well as the opposition, to unite in the interest of their nation and to realise the goals of the January 25 revolution.